Spacious GFF with 2 double beds, lounge, kitchen/breakfast room, bathroom, dining hall, garage & garden. Enjoys gas central heating, double glazing & no chain. Convenient position close to town & facilities. A self-contained ground floor flat, 1 of 2 flats in this Victorian semi-detached house built with elevations predominantly of local limestone with Bathstone dressings, set under a pitched concrete tiled roof. The property enjoys gas central heating, UPVC double glazing, modern kitchen and bathroom with the accommodation comprising; dining hall, lounge, 2 double bedrooms, kitchen/breakfast room, bathroom, front garden, driveway providing parking and a garage and is offered with no onward chain. DINING HALL 21' 9" x 6' 10" (6.63m x 2.08m)narrowing to 5'10" (1.78m) min. Part coved ceiling, archway, picture rail, double and single radiators, Victorian style tile effect vinolay flooring, stripped and dipped timber doors to all principal rooms. 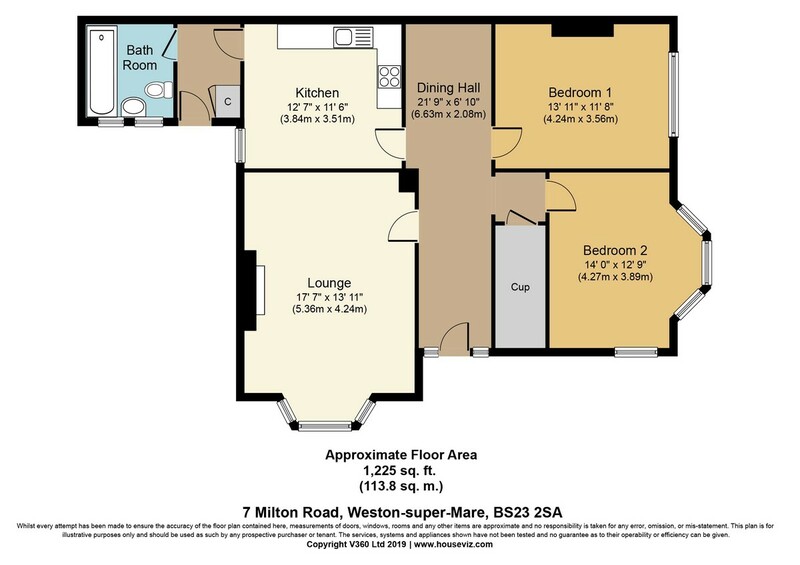 LOUNGE 17' 7" x 13' 11" (5.36m x 4.24m) UPVC double glazed south facing bay window to front, coved ceiling, picture rail, dado rail, chimney breast with brick surrounds, stone hearth and inset wood burner, stripped timber floorboards, TV point. KITCHEN/BREAKFAST ROOM 12' 7" x 11' 6" (3.84m x 3.51m) Modern kitchen with Beech effect units comprising double wall unit, double glass fronted display wall unit, 4 single wall units, matching extractor hood and light, corner display unit, single bowl single drainer stainless steel sink unit with mixer tap over and double cupboard under, further single base cupboards and drawers, plumbing for washing machine, timber effect roll edged worktops, tiled splashbacks, space for fridge/freezer, inset 4-ring gas hob with electric oven below, radiator with cover, Victorian style tile effect vinolay flooring, coved ceiling with two recessed spotlights, UPVC double glazed window to side. BEDROOM 1 13'11" (4.24m) plus UPVC double glazed shallow east facing bay window x 11'8" (3.56m) narrowing to 10'6" (3.2m) to chimney breast, coved ceiling, picture rail, radiator. INNER HALLWAY Access to useful part shelved walk-in storage area measuring 6' 8" x 5' 0" (2.03m x 1.52m) max. with light. BEDROOM 2 14' 0" x 12' 9" (4.27m x 3.89m) Into UPVC double glazed bay window with stripped timber surrounds, part coved ceiling, picture rail, dado rail, double radiator, TV point, telephone point, further UPVC double glazed window to front. BATHROOM Fitted with white suite comprising timber panelled Spa bath with mosaic style tiled surrounds with inset lighting, Victorian mixer tap and shower attachment and glazed screen, pedestal wash hand basin with tiled splashback, low-level WC, part timber clad walls to dado rail height, single radiator, 2 UPVC obscure double glazed windows to side. GARAGE 17' 3" x 8' 0" (5.26m x 2.44m) narrowing to 7'6" (2.29m) to pier of block construction with up-and-over door, light and power and rear personal door. Timber pedestrian side gate gives access to L-shaped pathway/courtyard area with useful storage area measuring 8' 3" x 4' 4" (2.51m x 1.32m).